Tobold wrote a really good post. His point is that in a skill point based game (where you can pick any skill combination) you have less choices than in a class based game (where you choose to be a "mage" at lvl1 and can't change it to "healer" unless you completely reroll. "[the fight] is a mathematical problem, which can be solved for any given set of parameters. So after every patch changing the calculations, theorycrafters come and solve the mathematical problem, and calculate the optimal templates for every given role. That then becomes the "flavor of the month" ... "Choice" for the player is an illusion, the best informed players will all "choose" the same optimum template. And the less well informed players who actually make choices themselves are referred to as "gimps", because they "gimped themselves" by making suboptimal choices." This is 100% true. If there would be free skill selection in WoW, there would be only 3 sets, "the tank", "the DPS" and "the healer", everyone else would be "tard". By having classes, Blizzard allows variations by making the changes impossibly expensive. For example in 3.2 the DPS cat druids did the highest DPS, however for a mage to become a cat druid the cost would be rerolling, leveling to 80 and getting full raid gear. I don't think that even the most hard-core guilds wanted their members to do it. So - grudgingly - they go to raid with sub-optimal DPS players: mages. However it's only a patch of the fundamental problem: why there is only one perfect solution? Exactly because the fight is perfectly known, and repeated all the time. That's why the choices can be calculated and the knowledge distributed. This scheme comes directly from the "persistent world" philosophy of the games. If all things are known, like a machine, we have no other choice than being either cogs in that machine, or useless junk. Imagine a game where the monsters have random abilities. I mean only their difficulty and set of skills are predefined, but they use them very differently every time they are encountered. For example one try the same mage boss use frost AoE spell mainly, the next try he uses single-target fireballs, on the third he use AoE silences and shadow dots. While his abilities can be enumerated, like "fireball, blizzard, CoA, arcane torrent, hellfire, mana burn, resist magic, inner fire", but the numbers would differ in a range every try. This way the more versatile players (and spec builds) are viable, as the maxed fire res + armor penetration physical DPS would be rocking against the fireball-inner fire boss, but the next try would be useless against the CoA-resist magic boss. A more balanced DPS could adapt more situations. With the boss changing damage done vs self-heal the DPS-heal line can be blurred, as the low-damage - high-heal boss can only be defeated if every able body is damaging him, while a glass-cannon AoE-boss needs lot of heals. With the changing number of adds, even the tank-DPS line can be broken as randomly coming, not AoE tankable, weak adds could be picked up by a hybrid warrior who pulls a shield but still makes much more damage than a full-time tank who is overkill for those adds. Strike that, the boss could change in fight phases randomly, so no group could optimize for one set of abilities, simply "try until he gives us CoA - arcane torrent - dampen magic and our full-physical team pwn him"
The different choices would all be viable, if played correctly. Some would be great on some fights and so-so on others, other builds would be OK everywhere but great nowhere. However it would increase the pro-noob rift. Currently the rift is between those who are informed and and those who are "I wunt read for a game lol". Only the ability to read, memorize, and obey the RL matters. Assuming you are not mentally incapacitated, it only needs effort. A random-boss would need quick thinking on your own. You are either creative and intelligent, or you are not. The non-slacker moron could no longer grind his way to the top. That's why randomly acting bosses will only be implemented in niche games. I can tell how much I disliked the "do this, do it this way, or be a tard" system of WoW. I've always tried to find my own ways, but it can only be done in a competitive environment if they have no more optimal solution. I could mix tank and raid-heal in Ulduar since the guild had not enough tank-healers. As soon as they got enough and I refused to / cannot properly do Rejuv-WG spam, my time ended there. However the persistent nature of the game can not stop you from be creative. For example look at this screenshot from Plants vs zombies (a game that distracted me more from WoW than anything in 3 years). This is a tower defense game, obviously with repetitive nature: all zombies of the same type are the same, they all coming from the same spots, and so on. If you did it once and repeat your actions, you get the very same outcome. 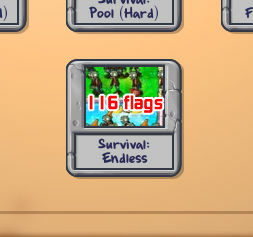 The screenshot shows I managed to kill 116 waves of zombies (all harder than the previous), with the planting strategy I came up. Of course anyone can do the same if he plants the same vegetables. However I saw this pattern nowhere, came up with it myself. The challenge comes simply from obscurity. While this pattern existed before, and probably done by others too, I don't (and in lack of internet community cannot) find them, have to make it myself. I'm currently on a quest in WoW to do the same: find challenging content that is unique enough to make sure no one else bothered to do it. I show the first results to you soon. Pike did something similar, worth reading. If all things are known, like a machine, we have no other choice than being either cogs in that machine, or useless junk. I quite like this post Gevlon, and I draw the same conclusions. A great many creative pursuits can be considered anti-social; authors, painters, photographers and composers may spend many long and lonely hours in their pursuits. Being a nonconformist may well be unsocial, but how else can anyone generate something original? And that is what I like most about this blog; you're taking a game of conformity and keeping it fresh and interesting by playing it differently, be it through Blue Ulduar or Auction House PvP. Great stuff, keep it coming. Now that I think of it, I've kinda gone out of my way for challenge since I started playing wow. My first toon was a human mage, all of the people I talked to gave advice along the lines of, "Level as frost, It's easier" But I looked through the trees and thought fire seemed more interesting than frost, and I liked the Idea of a more challenging way to level. When I started playing my current main (prot pally) back in TBC, the de-facto tank was the prot warrior. Prot pallies were definately sub-optimal for raid tanking and the thought of playing the more challenging, 'sub optimal' way appealed to me, which is part of the reason I rolled a prot pally. I'm not sure Tobold is correct, certainly for a given spec there are optimal gearing parameters that a compotent player will fall within however to say "the best informed players will all 'choose' the same optimum template" is fundamentally incorrect. To give a quick example, at mid-ToC-25 gear levels a combat rogue has a choice between high rupture rotations using 4/5 t8 or a ruptureless high arpen setup. Using the spreadsheet a player can see that until you have ilevel 245 gear in 5/5 slots (although not necessarily tier gear) a high rupture setup is better by somewhere around 1-3% in terms of sustained single target damage. Case closed right? According to Tobold's characterization yes however its not that simple, the ruptureless rotation while being behind in sustained dps does significantly better on quick target swaps and is higher dps on a burn target on burn phases lasting less then 20-28 seconds (depending on specific gearing). Thus the player has a choice, do they choose the higher sustained dps or the higher burn target dps. That decision is a real choice based on which is prioritized (possibly based on raid comp or strat), certainly both options have some basic spec and gearing/gemming parameters however to say that an informed player will always make the same choice would be inaccurate. Gevlon has always said that M&S are the ones that spend gold on useless stuff like expensive mounts pets etc.. I buy mammoths, bikes and other expensive mounts to collect as many as mounts as possible in the game as a challenge. Does this correlate to M&S behaviour or creative ways to find challenges in the game? This would require major redesign of all aspects of the game related to raiding, and to player thinking. There couldn't be instant-kill mechanisms unless they were blatantly obvious. It's one thing to require thinking on the fly, another to know that I have to stand on the snow to avoid deep freeze (whatever that is). The margins of error would have to be much larger to account for people reacting rather than knowing in advance. It would be nearly impossible to balance as well, so some groups might face an easy enemy: MS on the tank, so someone taunts until it wears off plus void zones and a frontal cleave. Other groups might face void zones with frost nova and random spell interrupts. I like the idea, I've argued for it before, but it has a lot of problems, the least of which are your imaginary swarms of idiots. Have you considered trying to make your own game? That way you could avoid the mass-market tendencies of current games and design it as you see fit. It's one thing to criticize or suggest; but making your own game entirely, I think that's the peak of doing it your own way. @Anonymous: it's just grindy. Challenging is something you can't be sure you succeed. Gaining the Mammoth is not challenging. Even a daily quest grinding idiot can do it: grind 800 dailies and you have a Mammoth. You started with "fixed fight is a math task for finding optimal builds and combinations". Then you lead to "let each fight have a fixed range of variations". But it's a math task too, and you can min-max it to optimal solution too. It will be more complicated calculations, but it still can be done. This crosses alot of peoples minds. hell mine even and I am acting on it. My experience is the large rift in information to going about it. 1) Try and find good coders to work for free or a small paycheck. 3) find other people who fit into your idealscape to work with.. It is by far not an easy venture, one that requires ALOT of time to do. and if you'r not saavy in such application as 3dsmax/zbrush/or hellbasic 3d environment world builders like steams' source SDK.. well your not going anywhere with it..... or your going to be throwing money out your assfor people who can. There already exists top-level competition in WoW: arenas, progression and world firsts. There are sites dedicated to tracking these achievements. And as Olga has already pointed out, optimal solutions will exist even if the game is more 'random'. I'm sure the theorycrafters will figure it all out. Actually, MgT was unfair because if you had no CC and had an unfavourable matchup, the 5v5 would be simply impossible. Imagine going against that MS warrior without being able to CC him. Random abilities. Sounds a bit like the random bosses you get for example in the Karazhan opera event. As for random abilities. If it changes each attempt, people would just reset it until they get an easy combo (road of less resistance). If it changes each reset they could go and respec for the scenario. It reminds me of Nefarion in vanilla Blackwing Lair. That boss had random adds each reset. Some would be resistant to fire, some to frost, some hit a bit harder... You had to adapt your stragegy a bit. "Frost on left" would be yelled an then the fire mages could run to that side. If another attempt was needed you knew what to expect and set your strategy right. Worst case scenario you let your mages go and respec for the fight. Random abilities would just add more youtube movies. "You have this combo (e.g. frost & fire)? Do it like this". It wouldn't really require more strategy. Actually there is already an in-game implementation that nay-says this. Instructor Raz, first boss in Naxx 25 military quarter. An absence of priests would be, let's call it, suboptimal. In this specific case the solution made by Blizard is plainly artificial for a gimmick fight. A better overall solution aimed at removing the 100% best build for solving a type of problem, is, of course, to avoid creating generic types of problems. Something as simple as having NPC-opponents vulnerable or more resilient to effects solves this. Skeletons take half damage from piercing damage, ice-elementals are vulnerable to heat, fire-elementals are highly resistant to heat, etc, etc, etc. I would personally prefer true AoE damage, but then it wouldn't be WoW as we know it. Still, grenades are good for clearing large numbers of mobs -- including your own teammates, should they stay in the blast-area. Hence grenades are your best choise as long as collateral damage is not an issue. "Such activity is necessarily anti-social"
I disagree and think you are short changing yourself with such a statement. 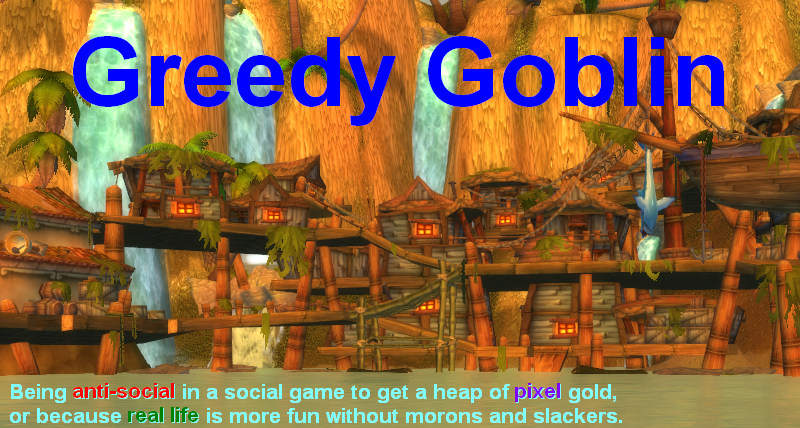 My challenge in WoW is very much to find a social group with little to no drama (a challenge in itself) and see how far that group can go in content. Like even the most optimal group with truely challenging content... you hit a wall. At that wall you can measure improvement. I cheat a bit. I read the appropriate forums, find the optimal gear and specs, understand the strategies, and end up gearing whichever class i think gives us the best chance of success. That all said, there IS challenge when you know that one of your DKs can only do 1200 dps and doesn't know how to get out of the fire while your main healer is constantly distracted by kids in the background. You can get frustrated by such handicaps... or you can accept them as barriers to achievement. They aren't barriers placed there by developers, bu tthey are barriers that can be overcome... and they are unpredictable which is far more fun than designed barriers which can be solved once making future encounters predictable. An optimal guild works weekly on the same hard mode encounters... over and over again if they are appropriately challenging. A sub-optimal group repeats content as well over and over again until their skill increases or they out gear it. The mechanics are the same in both cases with the exception of being able to show off your achievement (social). In my case I find that mechanic tolerable when the drama of having to remove people who can't GTFOOTF is removed. It's frustrating to not beat something because 2 or 3 people are holding you back... but no less so than not beating harder content because 2 or 3 people are holding you back (even if they are exponentially more skilled than the former group). That's a challenge. Join a group that does not have rotating members. See what you can personally do to improve their progress. It's measurable, obvious, and depending on your temperment... a lot more fun. You get to combine using knowledge of optimal solutions with solving non stactic problems. Hehe, Gevlon, you remind me of the character in the short story "The Most Dangerous Game"-- he decided there was no challenge in hunting "mindless" creatures and went after humans instead, because they could think, and he could outsmart them. Theorycraft is exactly that - theory. Spreadsheets can tell you the optimal build, but only in optimal conditions. Destruction warlock glyphing for example; I've taken heat from guildmates for keeping my immolate glpyh over life tap, despite EJ showing it as suboptimal at my gear level. Looking at the content we're working on, however (ToGC25 Twins / Ulduar25 Firefighter) makes the idea of increasing the damage I'm taking by life tapping to keep a buff active a less attractive proposition than a slightly suboptimal, but passive, buff. If you look at the pure DPS classes there's a lot more flexibility in playstyle. Going back to warlocks, affliction is currently suboptimal on paper, but in a world of encounters that emphasize mobility and target cycling, it actually keeps up with destruction. I've seen our mages, rogues, and hunters do equally well with different specs, and within those specs there are often "free" talent points left over to tailor a spec built around a few core talents. Priests also have a choice in healing playstyle between discipline and holy, and both of those specs have a number of those "free" points to adjust the core mechanics of the spec. Really it's the rise of the hybrid classes that's highlighting pigeonholing in both theorycraft and actual encounters. If you want to DPS as a paladin, you're ret. Heal as a druid? Tree. Melee shaman? Enhancement. Etc, etc, etc. Feral druids were nerfed last patch. So, the most optimal dps actually varies and its kinda a crap shot as to which class that month does the most dps. Hunters ruled the roost in the beginning of Wrath. Now they are okay dps, not as bad as warriors, but not as good as others. While it is true for RAID situations there is an optimal mashing of buttons, for pretty much everything else that optima doesn't exist or matter. Does it matter that your dps isn't optimal while leveling? Not really. You can level as very unoptimal specs like prot paly (and they have been buffed so much that its now an optimal speec), or holy whatever. I had in our guild a DK that did 300 dps in naxx. Thats right 300 dps. ALl he did is autoattack. Somehow this person got to 80 doing nothing but autoattack. So I somewhat disagree, its only for raids that there is one optimal spec per class, and actually it does dependon the boss which class will do more dps. For something like patchwerk, hunters do really really well, for movement bosses locks do well. By the way you aren't anti-social, I dont know why you keep saying that. Look it up in DSM IV. Here's a suggestion, Gev - solo Wrath 80 instances and/or Heroics. As a Druid, I suspect you could do it. I'm doing it as a Holy/Prot hybrid Paladin. I'm using PvP gear because of the Stam and crit immunity, but you could probably do it in PvE gear. So far I've cleared to and killed one boss totally solo - Heroic Krystallus in HoS. I'm close to being able to get to Meathook in CoT: Strat, but locking down casters is tough. Personally I find I enjoy a hybrid system best of all, but those games typically don't fare well with M&S who just want to read a strat somewhere or have someone else give them the cookie cutter FOTM build. The sheep follow the path of least of resistance, effectively furthering this design template by financing only those games which they feel comfortable with. I can certainly understand the draw of doing something original or if not completely new at least not slavishly unoriginal. I've found that most of the people I've come across on my server feel there is only the "One True Way" to do much of what can be done in the game. I was once running UD Strat on my mage, working toward the Argent achievement and hoping to see the mount drop and noticed my guild had a couple members whose alts were in the 50s. I offered to have them come in and knock out a few quests. One of the three people suddenly dropped and rejoined on his 80 tank. I didn't think much about it until the end when he made some comment. I realized the reason he joined was that he didn't believe a mage could solo UD Strat. This is one of my few complaints about WOLK. The content has been dumbed down to the point where you don't have to think or try something original. Get your tank, healer and dps and aoe the instance down. Rinse and repeat. No one needs to think or adapt and that is a shame. Another example of random ability mobs were in the beginning of AQ40. From what I remember, there were 4 guys in each pull - and each of them would randomly pick from a selection of abilities. I remember a shadowbolt AoE, a melee-range stun. When we first went in we wiped on those guys a few times. And even months later we would have to initiate the pull, see what we were faced with, and then adapt accordingly. Someone may have already mentioned this, but ToC Faction Champs? Easily the most fun I've had in a raid for *ages*. Nothing beats that moment after Jaraxxus goes down, and the raid waits breathlessly for the Champs to drop. What combo will it be this week? I really enjoy the way we aas individual raiders need to adapt constantly in the fight (dusting off abilities we normally never use) and how as a whole raid we need to modulate our strategy each time, every week. It's certainly a good watershed - there are guilds that are consistently 2/5 ToC and there are those that are 5/5. It would be great to get some more of these sorts of fights. oh no. Please don't remind me of the horrors of AQ40 and Nef. It was really hard then. The very very unnerfed version of Nef had the colours of its whelp change with every encounter. Which means you can like go in, wipe and then try again. Because the next attempt would be different. Similarly, the trash in AQ40 were crazy. Especially those on the way to twin emps. Those damn giants had 2 random abilities and thankfully, they keep their abilities even after you wipe. @Pike "he decided there was no challenge in hunting "mindless" creatures and went after humans instead,"
- I think this pretty much sums up EVE Online. It would be perfect for Gevlon as the typical EVE player's contempt for the average WoW player at least rivals his. And it would be interesting to see him in the marketplace. roll druid/pally and decide which 2 of the 3 roles you want to be after you get to 80. You can go to where there are random bosses - a way of getting random abilities - some of which favor some setups/classes - e.g. reward shackle undead vs enslave demon vs spell steal. But why stop at random? A boss can use their [limited] AI to choose those abilities; some randomness but mainly responding to play actions. E.g., the boss uses an arcane explosion AOE around him if there are many melee; a silence if there are casters; it responds to the player actions. The GG boss AI would even shift damage away from people who stood in fire, in an elitist assumption they were less of a threat. I don't appreciate the create artificial challenges appeal as much as some. Some suggestions are: Never play sober and the ultimate challenge - only use unpatched Microsoft operating systems without a firewall. "How is running level 10s from Orgrimmar to Teldrassil challenging? All it takes is time. =P"
The point, in case its unclear, is that Pike set himself a unique challenge and then did it. It took planning and forethought and effort, but he pulled it off. "Someone may have already mentioned this, but ToC Faction Champs? Easily the most fun I've had in a raid for *ages*." The other great thing about faction champs is that it forces you as a DPSer to play defensively and winds up being great experience for other fights. Its practice in using "Oh Sh*t" buttons you rarely otherwise use, and its mechanics can't be "memorized" the way most boss mechanics can. 1) Speed Runs. Set up and run a contest for "fastest ToC clear". Join one of the groups doing said runs. I know such contests existed for Naxx, but they may not exist for ToC yet. 2) Gold-raids might be something you'd be interested in leading. Seems right up your alley in terms of low-commitment, kicking slackers, and playing with dedicated people. 3) You have the sort of mind that might be interested in the field of WoW-ology. Find ways to study interesting trends in the game. 4) Something social. What better way to prove skill > gear than recruiting people now for a "just hit 80s guild" and have the guild mission be to become a Server First guild in Cataclysm. 5) Relatedly, start a "WoW n00b school" with some burned out progression raiders. Expand on your mentorship program here. You teach gold-making and how to not be a scrub, they lead the encounters. My guild has a Training Wheels program that takes raiders from "what are talent points" to having shots at filling in for progression slots inside 2 months. Currently the rift is between those who are informed and and those who are "I wunt read for a game lol". Only the ability to read, memorize, and obey the RL matters. Assuming you are not mentally incapacitated, it only needs effort. A random-boss would need quick thinking on your own. You are either creative and intelligent, or you are not. The non-slacker moron could no longer grind his way to the top. That's why randomly acting bosses will only be implemented in niche games.